Not to be confused with Doc Strange, Doctor Stranger, Doc Savage, Dr. Strangelove, Hugo Strange or Strange Case of Doctor Jekyll. For other uses, see Doctor Strange (disambiguation). Doctor Stephen Strange is a fictional superhero appearing in American comic books published by Marvel Comics. Created by artist Steve Ditko and writer Stan Lee, the character first appeared in Strange Tales #110 (cover-dated July 1963). Doctor Strange serves as the Sorcerer Supreme, the primary protector of Earth against magical and mystical threats. Inspired by stories of black magic and Chandu the Magician, Strange was created during the Silver Age of Comic Books to bring a different kind of character and themes of mysticism to Marvel Comics. Textless cover of Doctor Strange #2 (Jan. 2016). The character's origin story indicates that he was once an egoistical surgeon. After a car accident severely damages his hands and hinders his ability to perform surgery, he searches the globe for a way to repair them and encounters the Ancient One. After becoming one of the old Sorcerer Supreme's students, he becomes a practitioner of both the mystical arts and the martial arts. He has a suit consisting of two main relics, the Cloak of Levitation and the Eye of Agamotto, which give him added powers. Strange is aided along the way by his friend and valet, Wong, and a large assortment of mystical objects. He takes up residence in a mansion called the Sanctum Sanctorum, located in New York City. Later, Strange takes the title of Sorcerer Supreme to help to defend the world against future threats. In 2008, Doctor Strange was ranked 83rd in Wizard's "200 Greatest Comic Book Characters of All Time" list, and in 2012 was ranked 33rd in IGN's list of "The Top 50 Avengers". He was also ranked 38th on IGN's list of "Top 100 Comic Book Heroes". The character was first portrayed in live-action by Peter Hooten in the 1978 television film Dr. Strange. Benedict Cumberbatch portrays the character in the Marvel Cinematic Universe, first appearing in the role in the 2016 film Doctor Strange. He reprised the role in the 2017 film Thor: Ragnarok, the 2018 film Avengers: Infinity War and in the 2019 film Avengers: Endgame. Well, we have a new character in the works for Strange Tales (just a 5-page filler named Dr. Strange) Steve Ditko is gonna draw him. It has sort of a black magic theme. The first story is nothing great, but perhaps we can make something of him-- 'twas Steve's idea and I figured we'd give it a chance, although again, we had to rush the first one too much. Little sidelight: Originally decided to call him Mr. Strange, but thought the "Mr." bit too similar to Mr. Fantastic -- now, however, I remember we had a villain called Dr. Strange just recently in one of our mags, hope it won't be too confusing! The Dr. Strange stories of the 1960s constructed a cohesive cosmology that would have thrilled any self-respecting theosophist. College students, minds freshly opened by psychedelic experiences and Eastern mysticism, read Ditko and Lee's Dr. Strange stories with the belief of a recent Hare Krishna convert. Meaning was everywhere, and readers analyzed the Dr. Strange stories for their relationship to Egyptian myths, Sumerian gods, and Jungian archetypes. "People who read Doctor Strange thought people at Marvel must be heads [i.e., drug users]," recalled then-associate editor and former Doctor Strange writer Roy Thomas in 1971, "because they had had similar experiences high on mushrooms. But I don't use hallucinogens, nor do I think any artists do." Doctor Strange #177 (Feb. 1969), the debut of Strange's short-lived new look. Cover art by Gene Colan and Tom Palmer. Steve Ditko contributed some of his most surrealistic work to the comic book and gave it a disorienting, hallucinogenic quality. Dr. Strange's adventures take place in bizarre worlds and twisting dimensions that resembled Salvador Dalí paintings. Inspired by the pulp-fiction magicians of Stan Lee's childhood as well as by contemporary Beat culture, Dr. Strange remarkably predicted the youth counterculture's fascination with Eastern mysticism and psychedelia. Never among Marvel's more popular or accessible characters, Dr. Strange still found a niche among an audience seeking a challenging alternative to more conventional superhero fare. As co-plotter and later sole plotter in the Marvel Method, Ditko took Strange into ever-more-abstract realms. In a 17-issue story arc in Strange Tales #130-146 (March 1965 – July 1966), Ditko introduced the cosmic character Eternity, who personified the universe and was depicted as a silhouette filled with the cosmos. Golden Age artist/writer Bill Everett succeeded Ditko as artist with issues #147-152, followed by Marie Severin through #160 and Dan Adkins through #168, the final issue before the Nick Fury feature moved to its own title and Strange Tales was renamed Doctor Strange. Expanded to 20 pages per issue, the Doctor Strange solo series ran 15 issues, #169-183 (June 1968 – November 1969), continuing the numbering of Strange Tales. Thomas wrote the run of new stories, joined after the first three issues by the art team of penciler Gene Colan and inker Tom Palmer through the end. After plans were announced for a never-realized split book series featuring Doctor Strange and Iceman, each in solo adventures, Strange next appeared in the first three issues (December 1971 – June 1972) of the quarterly showcase title Marvel Feature. He appeared in both the main story detailing the formation of superhero "non-team" the Defenders, and the related back-up story. The character then starred in a revival solo series in Marvel Premiere #3-14 (July 1972 – March 1974). This arc marked the debut of another recurring foe, the entity Shuma-Gorath, created by writer Steve Englehart and artist Frank Brunner, who took over as the regular creative team starting with Marvel Premiere #10. Englehart and Brunner collaborated closely on the stories, meeting over dinner every two months to discuss the series, and their run became known for its psychedelic visuals and plots. In issues #8-10 (May–September 1973), Strange is forced to shut down the Ancient One's mind, causing his mentor's physical death. Strange then assumes the title of Sorcerer Supreme. Englehart and Brunner created another multi-issue storyline featuring sorcerer Sise-Neg ("Genesis" spelled backward) going back through history, collecting all magical energies, until he reaches the beginning of the universe, becomes all-powerful and creates it anew, leaving Strange to wonder whether this was, paradoxically, the original creation. Stan Lee, seeing the issue after publication, ordered Englehart and Brunner to print a retraction saying this was not God but a god, to avoid offending religious readers. The writer and artist concocted a fake letter from a fictitious minister praising the story, and mailed it to Marvel from Texas. Marvel unwittingly printed the letter and dropped the retraction. Due to the growing number of Doctor Strange readers, the Marvel Premiere series segued to the character's second ongoing title, Doctor Strange: Master of the Mystic Arts, also known as Doctor Strange vol. 2, which ran 81 issues (June 1974 – Feb. 1987). Doctor Strange #14 featured a crossover story with The Tomb of Dracula #44, another series which was being drawn by Gene Colan at the time. In Englehart's final story, he sent Dr. Strange back in time to meet Benjamin Franklin. Strange met his allies Topaz in #75 (Feb, 1986) and Rintrah in #80 (December 1986). The series ended with a cliffhanger as his home, the Sanctum Sanctorum, was heavily damaged during a battle. Among the losses was Doctor Strange's entire collection of mystic books and other important artifacts. As a consequence, Strange was now considerably weaker and several spells designed to protect humanity from vampires and the evil serpent god Set expired. The title was discontinued so that the character's adventures could be transferred to another split book format series. Strange Tales vol. 2, #1-19 (April 1987 – Oct. 1988) was shared with street heroes Cloak and Dagger. This new Doctor Strange series resolved Strange's quest to reclaim his power and missing artifacts, as well as resurrecting the Defenders, who had died in the last issue of that team's title. Strange was returned to his own series, this time titled Doctor Strange: Sorcerer Supreme, which ran 90 issues (November 1988 – June 1996). The initial creative team was writer Peter B. Gillis and artists Richard Case and Randy Emberlin, with storylines often spanning multiple issues. Strange lost the title of "Sorcerer Supreme" in issues #48-49 (Dec. 1992 – Jan. 1993) when he refused to fight a war on behalf of the Vishanti, the mystical entities that empower his spells. During this time the series became part of the "Midnight Sons" group of Marvel's supernatural comics. Doctor Strange found new sources of magical strength in the form of chaos magic, as well as a magic construct he used as a proxy. He would form the Secret Defenders with a rotating roster of heroes, and reunite with the original Defenders. Strange regained his title in Doctor Strange: Sorcerer Supreme #80 (August 1995). Strange appeared with the Human Torch and the Thing in the one-shot publication Strange Tales vol. 3, #1 (Nov. 1994). The character was featured in several limited series. The first was Doctor Strange: The Flight of Bones #1-#4 (Feb.–May 1999), with a series of spontaneous combustions by criminals instigated by old foe Dormammu. Strange was the catalyst for the creation of a trio of sorceresses in Witches #1-#4 (Aug.-Nov. 2004). The Strange limited series (Nov. 2004 – July 2005) by writers J. Michael Straczynski and Samm Barnes updated the character's origin. Another limited series, Doctor Strange: The Oath #1-5 (Dec. 2006 – April 2007), written by Brian K. Vaughan and illustrated by Marcos Martin, focused on Strange's responsibilities as sorcerer and doctor. Doctor Strange has appeared in four graphic novels: Doctor Strange: Into Shamballa (1986); Doctor Strange & Doctor Doom: Triumph and Torment (1989); Spider-Man/Dr. Strange: The Way to Dusty Death (1992); and Dr. Strange: What Is It That Disturbs You, Stephen? (1997). Strange appeared as a supporting character for the bulk of the 2000s. He appeared regularly in The Amazing Spider-Man under J. Michael Straczynski, before being cast into a time loop by Baron Mordo. He later appeared on and off in The New Avengers, where he was stated as being part of the secret group known as the Illuminati to deal with future threats to Earth. Ultimately Strange joined the team and allowed them to use his home as a base after the events of the 2006 "Civil War" storyline, which he sat out. Doctor Strange was critical of the federal Superhuman Registration Act and aided the anti-registration Avengers team led by Luke Cage. During the Bendis run, Doctor Doom attacked the Avengers and manipulated the Scarlet Witch into eliminating most of the mutant population. Doctor Strange's failure to recognize Doom's hand in the former and to stop the latter caused him to start to doubt his abilities. 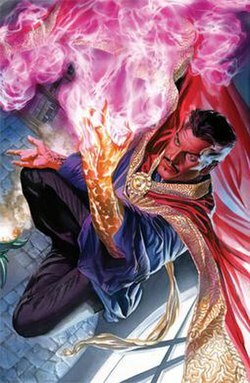 [volume & issue needed] After he was forced to use dark magic to confront an enraged Hulk, followed by further use of dark spells to save the New Avengers from the Hood's supervillain army, Strange renounced his status as Sorcerer Supreme, as he felt that he was no longer worthy of it. The Eye of Agamotto passed the mantle on to Brother Voodoo. Doctor Strange appeared as a regular character throughout the 2010-2013 The New Avengers series. Brother Voodoo, now newly appointed Sorcerer Supreme Doctor Voodoo, sacrifices himself in order to stop the powerful mystical entity Agamotto from reclaiming the Eye. A guilt-ridden Strange rejoins the New Avengers, and offers the team his valet Wong to act as their housekeeper. 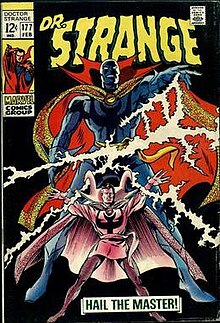 Strange eventually regains his position of Sorcerer Supreme, but is possessed by a demon[volume & issue needed] and becomes leader of the Black Priests. After the various Marvel universes merge into one, Doctor Strange acts as righthand man of Doctor Doom, who has become the ruler of this world after erasing all recollection of the previous separate realities that existed. Circumstances force Strange to open a pod that releases the surviving heroes of the original Marvel continuity, known as Earth-616. Doom kills Doctor Strange. During the "Infinity Countdown" storyline, Doctor Strange goes on a space mission. He encounters Super-Skrull who has the Time Gem. After defeating Super-Skrull, Doctor Strange claims the Time Gem. Doctor Strange then tracks down the Mind Gem and finds it in Turk Barrett's possession as Turk managed to evade him. When Black Widow's clone arrives seeking out Doctor Strange where she wants to dispose of the Space Stone, he did not want to take it as he knows what would happen if they are in the same proximity. Using a magic spell, Doctor Strange spoke to the holders of the Infinity Gems and requested a parley to reform the Infinity Watch. He states to Adam Warlock, Black Widow's clone, Captain Marvel, Star-Lord, and Turk Barrett that they need to safeguard them from such calamities even if one of them is Thanos. Stephen Strange, M.D., Ph.D., is an egotistical doctor who only cares about wealth from his career. The bones in his hands are shattered in a car accident, leading to extensive nerve damage. His hands tremble uncontrollably rendering him unable to perform surgery. Too vain to accept a teaching job, Strange desperately searches for a way to restore the motor function in his hands. After exhausting his funds, Strange becomes a drifter. Depressed and still searching, Strange happens to overhear two sailors discussing a hermit called the Ancient One (who is actually the Earth's Sorcerer Supreme) in the Himalayas, who can cure any ailment. Strange, nearly broke, seeks out the aged mystic. The Ancient One refuses to help Strange due to his arrogance, but senses a good side that he attempts to bring to the surface. He fails, but Strange's heroism appears when he discovers the Ancient One's disciple, Baron Mordo, attempting to kill the old man. After a confrontation with Mordo leads to him being shackled with restraining spells preventing him from either attacking Mordo or warning the Ancient One, Strange desperately and selflessly accepts the Ancient One's offer to become his apprentice to have some hope of helping the old man. The Ancient One, pleased at Strange's sincere change of heart, accepts the westerner and promptly frees him from the restraining spells while explaining he was aware of Mordo's treachery all along. Strange soon becomes Mordo's most enduring enemy, as the Ancient One teaches the doctor the mystic arts. After completing his training, Strange returns to New York City and takes up residence within the Sanctum Sanctorum, a townhouse located in Greenwich Village, and is soon assisted by his personal assistant Wong. As the Ancient One's disciple, Strange encounters the entity Nightmare, and other mystical foes before meeting Dormammu, a warlord from an alternate dimension called the "Dark Dimension". Strange is aided by a nameless girl, later called Clea, who is eventually revealed to be Dormammu's niece. When Strange helps a weakened Dormammu drive off the rampaging Mindless Ones and return them to their prison, he is allowed to leave unchallenged. In The Unbelievable Gwenpool #3, Strange encounters Gwendolyn Poole, who explains herself to be from a reality where all Marvel characters are fictional characters in comic books. As Strange helps her locate her home reality in order to create a fake background for her in the Marvel Universe so that she can get a Social Security number, driver's license and other essential documents, he discovers that Benedict Cumberbatch has been cast to play him in Gwen's universe, remarking that he "could see that". In addition to his magical abilities, Strange is trained in several martial arts disciplines, including judo, and has shown proficiency with numerous magically conjured weapons including swords and axes. Strange was a skilled neurosurgeon before nerve damage impaired his hands. Doctor Strange is described as "the mightiest magician in the cosmos" and "more powerful by far than any of your fellow humanoids" by Eternity, the sentience of the Marvel Universe. He holds the title of Sorcerer Supreme from 1973 (with the death of the Ancient One) to the present, except during an interruption from 1992 to 1995. He relinquishes the title once again in 2009, but reclaims it in 2012 when he proves himself willing to protect the world even without the title. The Book of the Vishanti is portrayed as being written by unknown authors, is closely associated with Doctor Strange, and is the greatest known source of white magical knowledge on Earth. The Book of the Vishanti contains spells of defensive magic and is indestructible. Its counterpart, the Darkhold, contains all the knowledge of black magic in the Marvel Universe, and is likewise indestructible. It is possible to destroy single pages of either book, but the balancing spell in the other book is destroyed as well to maintain a mystical balance. A collective of the three powerful magical beings - Agamotto, Oshtur and Hoggoth, known as the Vishanti - must allow the spell to be destroyed. Even though the book is a tome of benevolent magic, the spells within can still be dangerous when used improperly. This is proven when a young, inexperienced Strange tried to use the Book of the Vishanti to resurrect his dead brother Victor, but the spell, known as the Vampiric Verses, caused Victor to become the vampire Baron Blood years later. Apart from spells and mystical knowledge, the book also contains information about persons and events. It is unknown how the book is able to contain up to date and recent information even though it was written thousands of years ago. The first known owner of the book was the Atlantean sorcerer Varnae from around 18,500 BC. The next known owner was the Babylonian god Marduk Kurios. Marduk set a griffin to guard the Book. The sorcerer known as the Ancient One traveled back in time to c. 4000 BC and defeated the griffin and returned to the 20th century. The Ancient One would remain the book's owner, despite a brief loss when the dark wizard Kaluu returned the Book to the Griffin, until he deemed his student, Doctor Strange, worthy of taking it. Doctor Strange keeps the book in his town house library in New York City's Greenwich Village. He briefly lost the book when he destroyed his home to prevent the alien wizard Urthona from taking his magical artifacts, but the book was saved by Agamotto, who transported it to his realm and returned it to Strange some time later. The Orb of Agamotto is a powerful scrying crystal ball owned and used by Strange to detect magic in use anywhere in the world and provide Strange with a location and visual. The orb rests in Doctor Strange's Sanctum Sanctorum in a room called the Chamber of Shadows. It usually is inside a display case with three curved legs. When summoned, the glass covering rises and the ball levitates. While powerful, the Orb has been blocked by exceptionally powerful mystic forces (such as Umar) who do not want their exact location known. On at least one occasion, it has been used to open a dimensional portal to the realm of Agamotto. The character has starred in several alternate universe titles. In the miniseries Marvel 1602 #1-#8 (Nov. 2003 – June 2004), Sir Stephen Strange is both the court physician and magician to Queen Elizabeth I. The title Spider-Man 2099 introduced a female version of Strange who shares her body with a demon in issue #33 (1995). The miniseries Strange #1-#6 (Nov, 2004 – April 2005), written by J. Michael Straczynski and Samm Barnes, with artwork by Brandon Peterson, reimagined the character's origin, allies and enemies in a contemporary setting. In the alternate future universe of the Marvel imprint MC2, Doctor Strange is no longer the Sorcerer Supreme, the title there held by Doc Magnus. Doctor Strange uses his remaining power to reform the superhero team the Defenders in A-Next #3 (1998) and to fight the Norse god of mischief, Loki, Last Hero Standing #4 (Feb. 2005). The Ultimate Marvel title Ultimate Marvel Team-Up introduced a version of the character called "Stephen Strange, Jr.", the son of the original Doctor Strange, in Ultimate Marvel Team-Up #12 (July 2002). The character was killed in battle by the Ultimate Marvel version of Dormammu in the miniseries Ultimatum #1-#5 (Jan.–Sept. 2009). Two months before the debut of the sorcerer-hero Doctor Strange, Stan Lee (editor and story-plotter), Robert Bernstein (scripter, under the pseudonym "R. Berns"), and Jack Kirby (artist) introduced a criminal scientist and Ph.D. with the same surname (called "Carl Strange"). Making his sole appearance in the Iron Man story "The Stronghold of Dr. Strange" in Tales of Suspense #41 (1963), the character gained mental powers in a freak lightning strike. Dr. Strange appeared in Spider-Man and His Amazing Friends, voiced by John Stephenson. In the episode "7 Little Superheroes", he alongside Spider-Man, Iceman, Firestar, Captain America, Namor and Shanna the She-Devil are invited to the Chameleon's house on Wolf Island so that the heroes could be gotten rid of. Doctor Strange had a cameo appearance in the 1990s X-Men animated series. He was seen in the episode "The Dark Phoenix Saga (Part 3)". Doctor Strange appears in his self-titled episode of Spider-Man: The Animated Series, voiced by John Vernon. He and Wong help Spider-Man rescue Mary Jane Watson from Baron Mordo and Dormammu's clutches, and retrieve the Wand of Watoomb. After Spider-Man leaves, Doctor Strange detects the presence of Madame Web. Doctor Strange appeared in The Incredible Hulk episode "Mind Over Anti-Matter," voiced by Maurice LaMarche. He helps She-Hulk at the time when an unnamed evil entity has possessed the Hulk into the Dark Hulk. Doctor Strange appears in The Super Hero Squad Show, voiced by Roger Rose. He appears in the episodes "Enter Dormammu", "A Brat Walks Among Us", "Night in the Sanctorum", "Invader from the Dark Dimension", and "Election of Evil". Doctor Strange has made appearances in the Marvel animated shows on Disney XD, voiced initially by Jack Coleman, and later by Liam O'Brien. These shows include Ultimate Spider-Man, Hulk and the Agents of S.M.A.S.H., and Avengers Assemble. Doctor Strange appeared in several episodes of Marvel Disk Wars: The Avengers, voiced by Yasunori Masutani. Doctor Strange appears in Lego Marvel Super Heroes - Black Panther: Trouble in Wakanda, voiced again by Liam O'Brien. Peter Hooten starred as Dr. Stephen Strange in the live-action TV movie Dr. Strange, which premiered on September 6, 1978. In this film, Stephen Strange was a psychiatry resident rather than an experienced neurosurgeon. John Mills appeared as Thomas Lindmer, whom director-writer Philip DeGuere added to the story as a stand-in for the Ancient One. The 1992 film Doctor Mordrid began development as a Doctor Strange adaptation, but the studio's license expired before production began. The project was rewritten to change the main character's name and slightly alter his origin. In the direct-to-DVD animated film Doctor Strange: The Sorcerer Supreme, released August 14, 2007, Doctor Strange (voiced by Bryce Johnson) travels to Tibet, seeking to heal his hands after a car accident. Training with the Ancient One and his pupils, Strange faces the emergence of Dormammu. Its broadcast premiere occurred November 1, 2008 on Cartoon Network. Doctor Strange has a brief non-speaking cameo in the 2010 animated film Planet Hulk. He and the members of the Illuminati regretfully inform Hulk of the decisions made to ensure his removal from Earth. The character appears in the Marvel Cinematic Universe. He is first referenced as merely "Stephen Strange" in dialogue by Agent Sitwell in the 2014 film Captain America: The Winter Soldier, and first appears in the 2016 film Doctor Strange, in which he is portrayed by Benedict Cumberbatch. Cumberbatch reprises the role in Thor: Ragnarok, Avengers: Infinity War, and Avengers: Endgame. Doctor Strange appears in the 2016 animated film Hulk: Where Monsters Dwell, voiced by Liam O'Brien. Doctor Strange acts as Spider-Man's advisor in cutscenes in The Amazing Spider-Man vs. The Kingpin, on the Sega Master System and Sega Game Gear. Doctor Strange appears as a playable character in Marvel: Ultimate Alliance, voiced by James Horan. Doctor Strange appears in Hsien-Ko's ending in Marvel vs. Capcom 3: Fate of Two Worlds. He later appears as a playable character in the updated version Ultimate Marvel vs. Capcom 3, voiced by Rick Pasqualone. Doctor Strange appears as a playable character in Marvel Super Hero Squad Online, voiced by Charlie Adler. Doctor Strange appears as a playable character in the Facebook game Marvel: Avengers Alliance. Doctor Strange appears as a playable character in the 2012 fighting game Marvel Avengers: Battle for Earth, voiced by Chris Cox. Doctor Strange appears as a playable character in Marvel Heroes, voiced by Nick Jameson. Doctor Strange appears as a playable character in Lego Marvel Super Heroes, with James Horan reprising the role. Doctor Strange appears as a playable character in Marvel Contest of Champions for iOS and Android beginning in March 2015. Doctor Strange is a playable character in Lego Marvel's Avengers, voiced by Wally Wingert while Jack Coleman voices the version that appears in the "All-New, All-Different Doctor Strange" DLC. Doctor Strange is a playable character in the iOS and Android game Marvel Future Fight. There are two playable versions of Doctor Strange (as "Stephen Strange" and "Sorcerer Supreme" respectively) in the match-three mobile game Marvel Puzzle Quest. He was added to the game in November 2016. Doctor Strange appears as a playable character in Marvel vs. Capcom: Infinite, reprised by Liam O'Brien. Doctor Strange appears as a playable character in Marvel Powers United VR, reprised by Liam O'Brien. In 1979, Pocket Books published Doctor Strange, Master of the Mystic Arts: Nightmare, by William Rotsler. In the 1968 book The Electric Kool-Aid Acid Test, Tom Wolfe writes about Ken Kesey and the Merry Pranksters' interest in comics and specifically refers to Doctor Strange. In the 2006 novel Spider-Man: The Darkest Hours by author Jim Butcher, Strange appears briefly as a fellow superhero from whom Spider-Man seeks assistance when struggling against three vengeful siblings of Morlun. Doctor Strange is referenced in the 1971 song "Mambo Sun" by glam rock band T. Rex on their album Electric Warrior. ^ The blue "student" version first appeared in Strange Tales #110 (July 1963), with the red "master" version first appearing in Strange Tales #127 (Dec. 1964). ^ a b Reisman, Abraham (November 16, 2016). "The Creator of Doctor Strange Will Not See You Now". New York. Archived from the original on November 17, 2016. Creeping conflict became apparent a few months after Spider-Man’s debut, when Lee first announced the impending debut of their next co-creation, a magician named Doctor Strange. ^ "Wizard's 200 Greatest Comic Characters of All Time". Razorfine.com. Archived from the original on May 30, 2008. Retrieved May 8, 2008. ^ "The Top 50 Avengers". IGN. April 30, 2012. Archived from the original on March 17, 2015. Retrieved July 28, 2015. ^ "Dr. Strange - #38 Top Comic Book Heroes - IGN". IGN. Retrieved 30 April 2017. ^ "The Marvel Age of Comics, A letter written by Stan Lee to super-fan Dr". 2014-04-09. Archived from the original on 2014-04-09. Retrieved 2017-01-23. ^ Brevoort, Tom; DeFalco, Tom; Manning, Matthew, eds. (2008). Marvel Chronicle: A Year by Year History. London, United Kingdom: Dorling Kindersley. ISBN 978-0-7566-4123-8. DeFalco in "1960s" Brevoort, DeFalco & Manning 2008, p. 93 "When Dr. 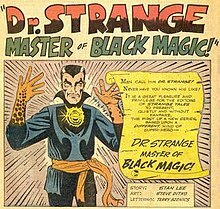 Strange first appeared in Strange Tales #110, it was only clear that he dabbled in black magic and had the ability to project his consciousness into an astral form that could leave his physical body." ^ Thomas, Roy (August 2011). "Stan Lee's Amazing Marvel Interview!". Alter Ego. Raleigh, North Carolina: TwoMorrows Publishing (104): 7–8. ^ Benton, Mike (1991). Superhero Comics of the Silver Age: The Illustrated History. Dallas, Texas: Taylor Publishing Company. p. 63. ISBN 978-0-87833-746-0. ^ Green, Robin (September 16, 1971). "Face Front! Clap Your Hands, You're on the Winning Team!". Rolling Stone. No. 91. via fan site Green Skin's Grab-Bag. p. 31. Archived from the original on October 7, 2010. Retrieved September 14, 2011. ^ Wright, Bradford (September 18, 2003). Comic Book Nation: The Transformation of Youth Culture in America. Baltimore, Maryland: Johns Hopkins University Press. p. 213. ISBN 978-0801874505. ^ "Strange Tales #134". Grand Comics Database. "Indexer notes: Part 5 of 17. First mention of Eternity. Strange would finally find it in Strange Tales #138 (November 1965)." ^ a b DeFalco in Brevoort, DeFalco & Manning 2008, p. 128 "Hailing 1968 as the beginning of the 'Second Age of Marvel Comics,' and with more titles to play with, editor Stan Lee discarded his split books and gave more characters their own titles…Strange Tales #168 [was followed] by Dr. Strange #169." ^ "Marvel News". Marvelmania Magazine. No. 5. 1970. p. 30. ^ Sanderson, Peter in Brevoort, DeFalco & Manning 2008, p. 151 "[Roy] Thomas and artist Ross Andru reunited [Doctor] Strange, the Hulk, and Namor as a brand new Marvel superhero team—the Defenders." ^ Sanderson "1970s" Brevoort, DeFalco & Manning 2008, p. 156 "Dr. Strange began a new series of solo adventures. He got off to an impressive start with [a] story scripted by Stan Lee and illustrated by Barry Windsor-Smith." ^ a b Brennaman, Chris (April 2014). "Marvel Premiere". Back Issue!. Raleigh, North Carolina: TwoMorrows Publishing (71): 22–23. ^ Cronin, Brian (December 22, 2005). "Comic Book Urban Legends Revealed #30". Comic Book Resources. Archived from the original on February 4, 2012. Retrieved December 26, 2008. We cooked up this plot—we wrote a letter from a Reverend Billingsley in Texas, a fictional person, saying that one of the children in his parish brought him the comic book, and he was astounded and thrilled by it, and he said, 'Wow, this is the best comic book I've ever read.' And we signed it 'Reverend so-and-so, Austin Texas'—and when Steve was in Texas, he mailed the letter so it had the proper postmark. Then, we got a phone call from Roy, and he said, 'Hey, about that retraction, I'm going to send you a letter, and instead of the retraction, I want you to print this letter.' And it was our letter! We printed our letter! Sanderson "1970s" in Brevoort, DeFalco & Manning 2008, p. 175 "The great Marvel artist Gene Colan was doing superb work illustrating both Doctor Strange and The Tomb of Dracula. So it made sense for Strange writer Steve Englehart and Tomb author Marv Wolfman to devise a crossover story." ^ Sanderson "1970s" in Brevoort, DeFalco & Manning 2008, p. 174 "The year 1976 was the 200th anniversary of the United States' Declaration of Independence. So it was appropriate that several of the major events in Marvel history that year dealt with political themes… In September, just before departing from Marvel for DC Comics, writer Steve Englehart sent Dr. Strange back through time to meet one of the men responsible for the Declaration of Independence, Benjamin Franklin." ^ Christiansen, Jeff (August 27, 2015). "Midnight Sons". The Appendix to the Handbook of the Marvel Universe. Archived from the original on October 25, 2015. Writer Roy Thomas and penciller Andre Coates created this new series that ran until 1995. Scribes J. Michael Straczynski and Samm Barnes, with artist Brandon Peterson, retold Dr. Strange's mystical origin for a new generation of fans in this six-issue limited series. ^ "New Avengers (2013 - Present)". Marvel Comics. 2013. Archived from the original on October 31, 2016. ^ Stroz, Casey. "Doctor Strange - Last Days of Magic Conjures Up New Characters!". BadCoyoteFunky. Retrieved 2017-01-07. ^ Doctor Strange Vol. 5 #1-3. Marvel Comics. ^ Infinity Countdown #5. Marvel Comics. Dr. Strange's archenemy, Baron Mordo, was introduced in Strange Tales #111. Clea, Dr. Strange's longtime girlfriend from the Dark Dimension, debuted in Strange Tales #126. ^ Meagan Damore (2016-06-23). "Benedict Cumberbatch Receives the Real Doctor Strangeâ€™s Seal of Approval". CBR. Retrieved 2017-06-01. ^ Thomas, Roy & Dann (Dec 1991). Doctor Strange (Issue 36 ed.). Marvel Comics. pp. 12, 13, 16, and 17. ^ a b Sanderson, Peter (2007). The Marvel Comics Guide to New York City (1st ed.). New York: Pocket Books. ISBN 1416531416. ^ Stern, Roger (2011). This Old House (Marvel Vault One Shot: Doctor Strange ed.). Marvel Comics. p. 15. ^ Gillis, Peter B. (Oct 1986). Doctor Strange (Issue 79 ed.). Marvel Comics. p. 11. ^ Christiansen, Jeff (May 11, 2002). "Doctor Strange". The Appendix to the Handbook of the Marvel Universe. Archived from the original on March 3, 2013. Retrieved March 3, 2013. ^ "Comics Continuum". Comics Continuum. July 28, 2009. Archived from the original on March 3, 2013. Retrieved September 13, 2010. ^ "Listings - Marvel's Hulk And The Agents Of S.M.A.S.H. On Disney Xd". The Futon Critic. n.d. Archived from the original on November 30, 2014. Retrieved March 10, 2014. ^ Fausett, Dan (director); Auman, Brandon (writer) (March 30, 2014). "Stranger in a Strange Land". Hulk and the Agents of S.M.A.S.H.. Season 1. Episode 20. Disney XD. ^ "Miles From Home". Ultimate Spider-Man. Season 4. Episode 3. February 28, 2016. Disney XD. ^ Ryan, Mike (June 4, 2014). "The Bizarre Case of the 1978 Doctor Strange Movie". ScreenCrush. Archived from the original on October 5, 2015. ^ a b Pauls, J. B. "The Rewind: Doctor Mordrid". Living Myth Magazine. Archived from the original on July 17, 2014. Retrieved May 9, 2014. ^ Fischer, Dennis (2011). Science Fiction Film Directors, 1895-1998. Jefferson, North Carolina: McFarland & Company. p. 88. ISBN 9780786485055. ^ "The Doctor is In: Doctor Strange DVD and Blu-Ray in Stores Now". Marvel Comics. August 14, 2007. Archived from the original on March 3, 2013. Retrieved March 3, 2013. ^ Strom, Marc (December 4, 2014). "Benedict Cumberbatch to play Doctor Strange". Marvel.com. Archived from the original on December 4, 2014. Retrieved December 4, 2014. ^ Simpson, George (September 26, 2016). "Benedict Cumberbatch's Doctor Strange CONFIRMED for Avengers: Infinity War". Daily Express. London, United Kingdom. Archived from the original on September 26, 2016. Retrieved September 26, 2016. ^ Wickline, Dan (October 7, 2016). "Where Monsters Dwell – Hulk Gets New Animated Feature With Dr Strange And The Howling Commandos". Bleeding Cool. Archived from the original on October 31, 2016. ^ Denick, Thom (2006). Marvel Ultimate Alliance: Signature Series Guide. Indianapolis, Indiana: Brady Games. pp. 44–45. ISBN 0-7440-0844-1. ^ Sinclair, Brendan (July 20, 2011). "Ultimate Marvel vs. Capcom 3 roster leaked". Gamespot.com. Archived from the original on March 3, 2013. Retrieved March 3, 2013. ^ Baker, Chris (October 31, 2011). "Doctor Strange is voiced by Rick Pasqualone". Twitter. Archived from the original on November 30, 2014. ^ "Marvel Avengers: Battle for Earth". IMDb. ^ "Dr. Strange has joined Marvel Heroes". MarvelHeroes.com. Gazillion Entertainment. March 28, 2014. Archived from the original on May 10, 2014. Retrieved October 30, 2016. ^ "Voice Of Doctor Strange - Marvel Heroes". Behind The Voice Actors. Archived from the original on October 31, 2016. Retrieved October 30, 2016. ^ "LEGO Marvel Super Heroes: Stan Lee sera jouable…" (in French). Brick Heroes. July 20, 2013. Archived from the original on July 9, 2014. Retrieved August 13, 2013. ^ "News | Marvel.com". News.marvel.com. 2016-10-28. Retrieved 2017-02-06. ^ Weiner, Robert G. (2008). Marvel Graphic Novels and Related Publications: An Annotated Guide to Comics, Prose Novels, Children's Books, Articles, Criticism and Reference Works, 1965-2005. Jefferson, North Carolina: McFarland & Company. p. 280. ISBN 978-0786425006. ^ Christiansen, Jeff (n.d.). "Marvel Novels". The Appendix to the Handbook of the Marvel Universe. Archived from the original on May 18, 2015. ^ Duncan, Randy; Smith, Matthew J. (2009). Power of Comics: History, Form and Culture. London, United Kingdom: Continuum International Publishing Group. p. 52. ISBN 978-0826429353. ^ Riesman, Abraham (June 4, 2014). "5 Things to Know About Doctor Strange, Marvel's Newest Movie Hero". www.vulture.com. Retrieved September 2, 2018. He's the only Marvel hero to make it into an iconic glam-rock song! 'Mambo Sun,' the opening track on T. Rex's legendary 1971 album Electric Warrior, features the lyric 'On a mountain range/I'm Doctor Strange for you.' How romantic. Wikimedia Commons has media related to Doctor Strange. Doctor Strange at Don Markstein's Toonopedia. Archived from the original on April 4, 2016.